The story “The Duchess and the Jeweler” reflects the English society of writer’s time. It was an age of change. The high-ups were coming down because of their moral decadence and the commoners were coming up. Once Oliver Bacon was very poor and lived in a filthy, little alley. He worked very hard and used fair and unfair means to become the richest jeweler of the England. He enjoys his present position. He is suffering from inferiority complex. There is a great difference between his present and past condition. He has become so important that each day he receives invitation cards from the aristocracy of the city. He has become very rich, but he is so greedy that he wants more and more wealth. One day the Duchess of Lambourne comes to sell some fake pearls. She induces him into buying those fake pearls very cleverly. She uses her daughter Diana as bait. She also invites him to the party where all the aristocracy will be present. Oliver Bacon buys the fake pearls because he wants to attend the party and spend the weekend with Diana. He loves Diana very much. Besides, he wants to move among aristocratic circles. The story “The Duchess and the Jeweler” by Virginia Woolf mirrors the society of England. Discuss. Whenever there is an age of change, the higher come down and lower downs go up. Discuss. The story describes the decadence of the aristocracy and the rise of the commoners. Comment. The story is a criticism on Victorian Society. 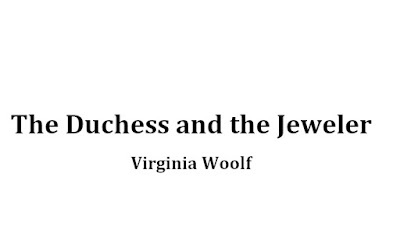 No doubt, the writer of the story “The Duchess and the Jeweler” reflects the English society of her time. It was an age of transition. The high-ups were coming down because of their moral decadence and the commoners were taking lead in spite of their psychological fixations. To fulfill her purpose, the writer introduces characters – the Duchess and the jeweler. The Duchess represents the high-ups. The jeweler represents the commoners. His name is Oliver Bacon. At the start of the story, the writer talks about commoners through Oliver Bacon, the jeweler. She tells the reader how the commoners took lead. Oliver Bacon was a commoner because he used to live in a filthy, little alley. Then slowly he took lead and became one of the high-ups of the English society. Now he lived at Piccadilly. It was the most fashionable and expensive place in London. He had become so important that each day he received invitation cards from the aristocracy of the English society. Even the Duchess of Lambourne waited for his pleasure outside his private office. Then the writer talks about the high-ups. To get her desired twenty-thousand, the Duchess had forgotten all her nobility. She was always in financial difficulties because of her moral decadence. She gambled. To arrange for the money she sold fake pearls to Oliver twice but this was not all. She had so much moral decadence that she used Diana, her daughter, to entrap Oliver Bacon. Did the Duchess of Lambourne sell the pearls to Oliver Bacon real? If not, why did the jeweler buy them? No doubt, the pearls sold by the Duchess of Lambourne to Oliver were false. Oliver Bacon bought them and paid twenty thousand because of two very strong reasons. Firstly, Oliver Bacon wanted to move among aristocratic circles. It was his greatest desire. He was a commoner. He used to live in a filthy, little alley. He worked hard to get to that position of the richest jeweler of England. Now it was his greatest desire to attend parties of the aristocrat. The Duchess induced him into buying fake pearls by telling him that the Prime Minister was going to attend the party. The second reason of buying his fake pearls was that he loved Diana. She was the daughter of the Duchess. The Duchess induced him by referring to Diana repeatedly. She said, “The Prime Minister – his Minister – his Royal Highness…” She stopped. “And Diana…” She added. Now he started imagining the party and its atmosphere. Why did the jeweler dismantle himself? Why did the jeweler remember his past life when he was very poor and lived in a filthy, little alley? It was very surprising that Oliver, who was one of the richest jewelers of England, dismantled himself repeatedly. However, when we read the story “The Duchess and the Jeweler” carefully, we find that he dismantled himself because of his inferiority complex. There was a great difference between his present and past life. He used to live in a filthy, little alley. His greatest ambition was to sell stolen dogs to fashionable women at that time. Therefore, he sold stolen dogs. Then he became a salesperson and sold cheap watches. Therefore, he was a commoner. When the Duchess of Lambourne came to see him, he kept her waiting outside his office and dismantled himself again. He wanted to enjoy his present condition. It was a great achievement that a boy, who used to live a filthy, little alley, was keeping a Duchess waiting. The writer describes his feelings very beautifully. It appeared to him that keeping her waiting; he was enjoying a very big feast. Why did Oliver Bacon, the jeweler keep the Duchess of Lambourne waiting? The jeweler kept the Duchess of Lambourne waiting because of his inferiority complex. He wanted to enjoy his present position of the richest jeweler of England. When we read the story “The Duchess and the Jeweler”, we find that Oliver Bacon used to live in a filthy, little alley. At that time, his greatest ambition was to sell stolen dogs to fashionable women and he did sell. Then he became salesperson and sold cheap watches. Then he did some other jobs to become rich. Therefore, he was a commoner. He did not anything common with the aristocratic class of that time. Now by working hard, he was the richest jeweler of England. There was a great difference between his past and present life but he has not forgotten his past. Therefore, when the Duchess of Lambourne came to see him, he kept her waiting just to enjoy his present position of the richest jeweler of England. It was a great honor for a boy of a filthy, little alley. The writer comments, “The Duchess of Lambourne, the daughter of a hundred Earls. She would wait for ten minutes on a chair at the counter. She would wait his pleasure. She would wait till he was ready to see her.” It was as if he was enjoying a very big and desirous feast. The jeweler who was once a commoner was now keeping a Duchess waiting. What a great achievement that was! Throw light on the greedy nature and inferiority complex of the jeweler. What psychological fixation did Oliver Bacon have in spite of becoming one of the richest jewelers of England? Psychological fixation means a strong unhealthy feeling of love or obsession. We find that the jeweler had two obsessions. Firstly, he wanted more and more wealth. It appears that his greed did not have an end. Secondly, he had inferiority complex and wanted to move among aristocratic circles to satisfy this complex. When we the story “The Duchess and the Jeweler” carefully we find that to show how greedy Oliver Bacon was the writer gives the examples of a giant hog and a camel. Oliver was greedy like a hog that always wants a bigger and blacker truffle. The writer means to say that Oliver Bacon wanted to become more and richer. Then the writer gives the example of a camel and says, “The camel is dissatisfied with its lot…” Therefore, Oliver Bacon had a strong, unhealthy love for wealth. He was very greedy and was never satisfied. Secondly, Oliver Bacon had a very unhealthy feeling of inferiority complex. To satisfy his inferiority complex, he kept the Duchess of Lambourne waiting outside his private office. He accepted the fake pearls because he wanted to move in aristocratic circles. He wanted to go to the party where he could see the Prime Minister and Diana. How did the Duchess deceive Oliver Bacon, the jeweler? How did the Duchess induce Oliver Bacon into buying fake pearls? The Duchess induced Oliver Bacon, the jeweler, into buying fake pearls very cleverly. Oliver Bacon hesitated thrice, but each time she induced him by using different tactics. She had many cards up her sleeve. She also had a trump card that she played at the last moment. She started inducing Oliver very cleverly. Firstly, she started in a very friendly way. She called him ‘dear Mr. Bacon’. Secondly, she mentioned the name of her daughters and told him that she was selling the pearl only for them. She knew that Oliver loved Diana. She was her daughter. Thirdly, to impress him, she started shedding tears. Fourthly, she called him an ‘old friend’ four times just to induce him. Oliver hesitated. He was doubtful about the pearls. He wanted to test them to know whether they were real. When she saw him hesitating, she used some different tactics. She invited him to a party at her estate. She induced him by telling him that the Prime Minister, his Minister, his Royal Highness, and Diana would be there. Therefore, she tried to take advantage of his inferiority complex and of his love for her daughter. He wrote twenty on the chequebook but hesitated again. When the Duchess saw him hesitating, she again used some tactics. Firstly, she called him by his Christian name just to create frankness. Secondly, she used her trump card. She again invited him to her estate for a long weekend. There he would go for riding in the woods alone with Diana. He could not resist any more. He wrote thousand and signed the cheque. They were friends, yet enemies; he was master, she was mistress; each cheated the other, each needed the other, each feared the other. Comment. This question has three parts and we shall discuss them one by one. Firstly, we discuss “They were friends; yet enemies.” When we read the story “The Duchess and the Jeweler”, we find that Oliver Bacon was a commoner. Later, he became the richest jeweler of England. On the other hand, the duchess was the member of the aristocracy by birth. Therefore, there was a great class difference between the two. These two classes could never be friends. However, the duchess was forced to call him an ‘old friend’ because o her moral decadence and financial problems. That was how they were friends; yet enemies. Secondly, we discuss “He was master, she was mistress.” When we read the story “The Duchess and the Jeweler” carefully, we find that Oliver became the richest jeweler of England by using fair and unfair means. Therefore, he was a master in the sense that he a great cheat. On the other hand, the Duchess was a mistress. She was a cheat too. She induced the jeweler into buying the fake pearls so cleverly that she appears to be a mistress in this sense. Write a note comparing the characters of the Duchess and the Jeweler. When we compare the characters of the Duchess and the jeweler, we find that the following statement is true for both of them:”They were friends, yet enemies; he was master, she was mistress; each cheated the other, each needed the other, each feared the other.” We shall discuss some points of this statement. Firstly, we discuss the second part of the statement: “He was master, she was mistress.” When we read the story “The Duchess and the Jeweler carefully we find that Oliver became the richest jeweler of England by using fair and unfair means. Therefore, he was a master in the sense that he was a great cheat. On the other hand, the Duchess was a mistress. She was a cheat too. She induced the jeweler into buying the fake pearls very cleverly. Secondly, we discuss the third part of the statement: “Each cheated the other, each needed the other, and each feared the other.” When we read the story, we find that each cheated the other. The jeweler cheated the duchess in a sense that he kept her waiting without any proper reason. He knew that the Duchess was telling a lie about the pearls, but he did not show it. It reason was that he wanted to go alone with Diana to the woods for riding. This was a kind of cheating. Describe the meeting between the Duchess and the jeweler. The Duchess of Lambourne came to sell ten fake pearls to Oliver Bacon, the jeweler. However, the jeweler kept her waiting for ten minutes. During those ten minutes, he enjoyed his present position of the richest jeweler of England. After ten minutes, the Duchess came in and tried to sell his fake pearls. She started inducing the jeweler and used different tactics. Firstly, she started in a very friendly way. She called him ‘dear Mr. Bacon’. Secondly, she mentioned the names of her daughters and told him that she was selling the pearls only for them. Thirdly, to impress him, she started shedding tears. Fourthly, she called him an ‘old friend’ four times just to induce him. Oliver hesitated. He was doubtful about the pearls. He wanted to test them to know whether they were real. When she saw him hesitating, she used some different tactics. She invited him to a party at her estate. Therefore, she tried to take advantage of his inferiority complex and of his love with her daughter Diana. She tried to move him by telling him that her honor was at stake. Now she was not an ordinary woman, she was the mother of Diana. He wrote twenty on the chequebook, but he hesitated again. Write a note on Oliver Bacon’s journey from filthy, little alley to the Bond Street. By birth, Oliver Bacon was a commoner. He was very poor. He used to live in a filthy, little street. At that time, his greatest ambition was to sell stolen dogs to fashionable women and he did sell. However, his mother stopped him from doing that. Then he became a salesman and sold cheap watches. After that, he took a wallet to Amsterdam. He earned a lot of money from three diamonds. He earned commission on the emerald. He bought a shop in Hatton Garden. He started sitting into the private room behind the shop. In the room, there were scales, a safe and thick magnifying glass. As soon as he became rich, he started dressing better and better. First, he bought a handsome cab then a car. He also bought a villa at Richmond. Then he bought a grand house at Piccadilly. It was the most central position in London. After that, he bought a shop in the street off Bond Street. His shop was famous in France, Germany, Austria, Italy, and in America. Now he had become so important that people from the aristocratic circle started sending him invitations to their parties. Even the Duchess of Lambourne waited for his pleasure outside his private office. Want these notes in Word or PDF format for free download? You may ask for these notes in the comments. I will email you the same. Or you may give us your email address here for these notes to be E-mailed to you. Note you will get a free E-Book when you give us your email address for mailing you the notes.